But you got that, right? I have three siblings, all of them younger: a brother, a sister and another brother, in that order. My youngest brother is a full ten years younger than I, which unfortunately meant our growing up years didn’t overlap much. By the time he was five and becoming “a person,” in my opinion, I was already 15 and too cool to spend a lot of time hanging out with my family. Plus, I had bangs to tease and jeans to pin. And I was still learning to roller-skate backwards in case a boy asked me to skate with him during The Snowball. To make matters worse, I got married at the tender age of 21 and moved to Arizona (state motto: Hell is Prettier But We’re Hotter) shortly thereafter. Thus ended the chance of a day-to-day relationship with Jonathan. Time passed. We both grew up. Corey and I moved to California (state motto: As Seen On TV) as soon as I realized Arizona doesn’t have water. Or grass. Or seasons. Or mercy. Eventually, my parents and my other siblings joined us there. But Jonathan did not. He stayed in Minnesota (state motto: Not Sweden But We Sure Try To Act Like It) to go to college and ended up establishing his life here in the Upper Midwest. Fast-forward a few years. Corey and I moved back to Minnesota, albeit two hours from where Jon lived. Jon and I started to get to know each other as adults, to form a relationship that wasn’t based solely on past memories. The growth was hindered by tough years. Corey and I hit rock bottom in our relationship. And if I told you all Jon has been through the past few months, you would accuse me of reading you a episode summary of “Days of Our Lives.” It’s been that bad – and that shattering. But now? Now, God has granted us the chance to live 15 minutes from each other. We are forming a real relationship, made even more tender by all we’ve been though. And my kids? They adore Uncle Jonathan. (“Unca Jon is CRAZY!” Connor shouted gleefully during one recent outing.) They fight over who gets to sit next to him at dinner. They beg him to do the trick where he eats Styrofoam balls only to make them magically reappear in their ears. They jump on him and hit him and tickle him and cry when he has to go. What a treasure family is. Living near Jon is one of my favorite things about living in Minnesota. 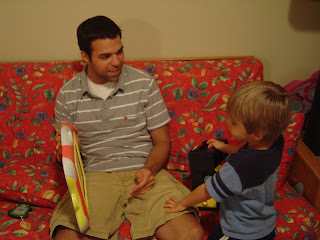 Jon and Connor play "Doodle, Doodle, Doodle." 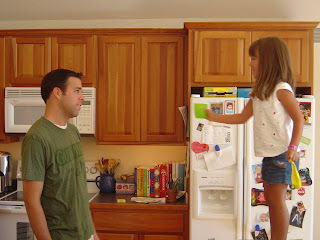 Natalie lectures Jon on the correct way to catch her when she jumps off the kitchen island. I loved this post. It reminded me of my own family. I have been watching every day for this post- and it has finally arrived! :) I was so thrilled- I am leaving my first blogger comment ever. I loved all you said- it warmed my heart. Isn't family great?!? Love you!